OUTOUR offers a wide range of products for your garden - everything from plants stands to garden storage shed, green house and fire pits. OUTOUR has you covered when it comes to enhancing your outdoor space. Traditional and timeless, gazebos evoke a sense of shelter, quiet solitude, and ornamental beauty. This four-sided gazebo arch by OUTOUR makes it easy to create anything from an elegant accent piece in a landscape or garden to a sacred space for peaceful meditation, wedding vows, or other outdoor ceremonies. Whether you dress it up or keep it simple, the gazebo arch offers exceptional versatility and a lovely addition to your yard. The birdcage shape and four tall side panels make the structure a nice choice for climbing vines like ivy, clematis, wisteria, grape vines, and more - allows them to grow naturally up towards the top. 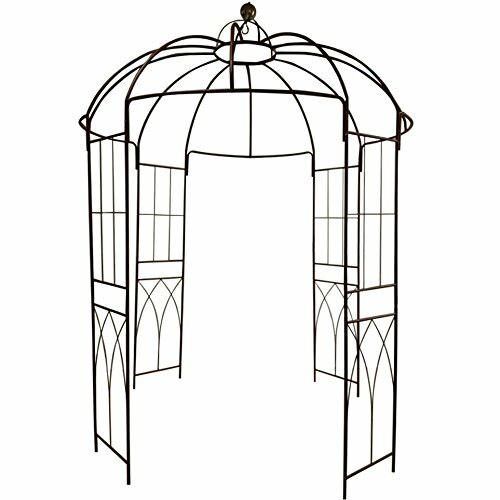 Made of strong, powder-coated wrought iron, this enchanting gazebo arch can stand up to harsh outdoor elements for high-quality performance and good looks throughout the year. The OUTOUR four-sided gazebo arch requires a friend to help you for some easy assembly and ground stakes come included to secure the panels into the ground, ensuring the structure stays put. If you have any questions about this product by OUTOUR, contact us by completing and submitting the form below. If you are looking for a specif part number, please include it with your message.